Well ladies and the occasional gentlemen, I am wide awake this morning since the regrettable time of 3:45am so Lorenzo and I decided to get moving with our day which means…I have a relatively quiet moment to write a blog post. Hooray! This hasn’t happened in a while around here so I decided to jump on the opportunity. The hubby and I were supposed to be flying to Mexico City this morning for a long weekend getaway, but decided to postpone our trip because of all of the impending rain and potential flooding this weekend. We didn’t like the idea of being gone and possibly being delayed in returning to our bunny puppy. Plus, bonus for me, I LOVE rainy weather! Rest assured, when I say I love it, I truly mean my heart gets excited about it. Bring on the rain boots, messy hair, and baseball caps. I love getting out in the rain to do errands or explore a new city when I’m on vacation and it rains. I traipse around without a care and with a lot of energy. Don’t get me wrong, I can enjoy a lazy rain day as well. Do you like the rain too? It makes me feel like fall is coming, but so does the month of September. Call me crazy because we live in Houston and it is certifiably miserable still in temperature, humidity, and the over abundance of those flesh seeking, blood sucking creatures affectionately known as mosquitoes. But, I digress on that. FALL IS HERE! I am a little late to join the true discussion with Shay on “How we do FALL” around here, but since I am in the spirit earlier than I aimed to be I figured why not discuss? September 1st marks the day I begin/began to light pumpkin scented candles. I love to light candles every day anyway as it gives off a soothing ambiance as well as whatever chosen scent. However, lighting pumpkin scented candles lights my heart right up with excited. My favorite time of year is finally upon us! The hubs and I love to pick out candles and we currently have a stash of four additional pumpkin scented ones to burn…we will not run out. ;) And last week I baked my Paleo crustless pumpkin pie for us as well! So-stinking-delicious. 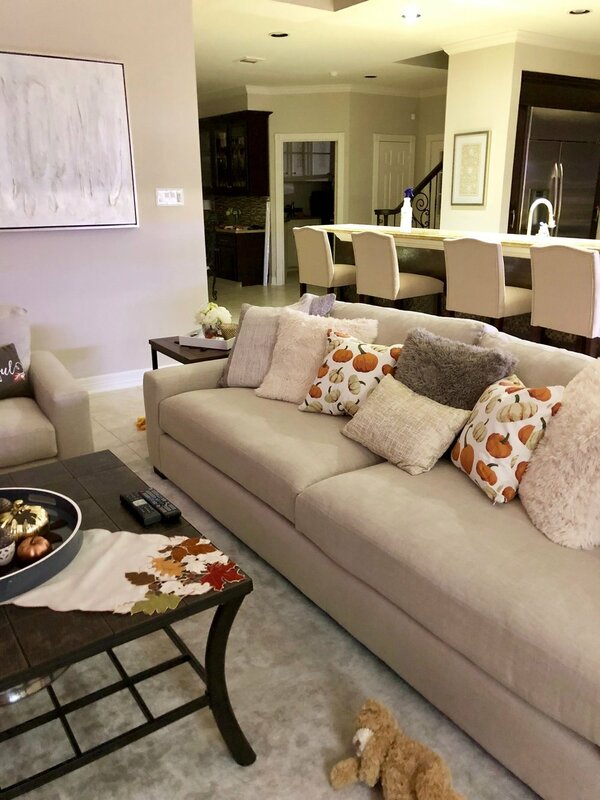 I attempted to wait until after our trip to Mexico City to truly decorate the house for fall, but I couldn’t stop myself this past week while the hubby was traveling for work…oops! It all started when I procured some larger faux pumpkins a couple of weeks ago while shopping at Marshall’s with my mom. When I got home I set them out by the fireplaces in our two living rooms and made sure they were hubby approved…and then I left them there. It was a harmless little fall addition while I counted down the days until I thought I’d decorate upon our return. I also thought I’d wait to purchase new fall decor until I put out all of my fall stuff to truly assess what we might need. That struggle was real. I came across a couple of items I knew our formal living room fireplace mantel just had to have that was fall and non-fall, so when I got home to set them up I simply unraveled in excitement. I lit my fall candle. I put on Home Alone (because I had already played Christmas Vacation twice since hubby left for his work trip). I am weak. I love the holidays. Hi, my name is Rebecca. I love everything fall related and everything Christmas related with a passion so intense it hurts my soul. I watch Christmas movies and listen to Christmas music periodically year round, too, while fantasizing about Christmas lights and snow. No, I have not sought help for this. Anyway…I excitedly dragged out the fall decor and spent the evening setting everything out, moving things from here to there until it was just right. We don’t have an overabundance of fall decor like we do/will for Christmas. But, I love to have just the right amount to add the seasonal, holiday feeling of fall to our home. I’m still considering how we’ll decorate our front porch, but for now I have a fall sign out front and once the weather cools off a bit (read-we lose some humidity) I will put out the fall wreath I made for the hubs last year before we were engaged and married! 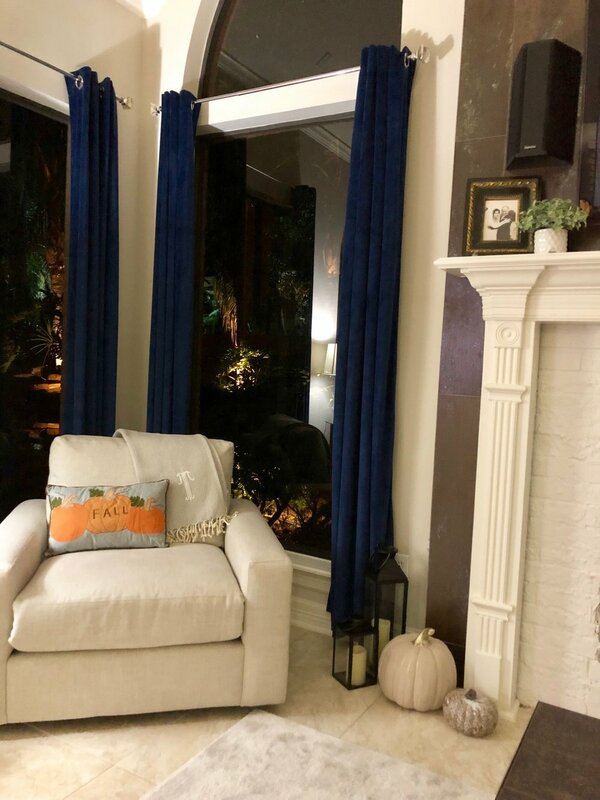 This garland from Michael’s was by far my favorite fall addition that is sooooo beautiful in person and the subtle colors look stunning in our formal living room. The online picture does not do it justice. 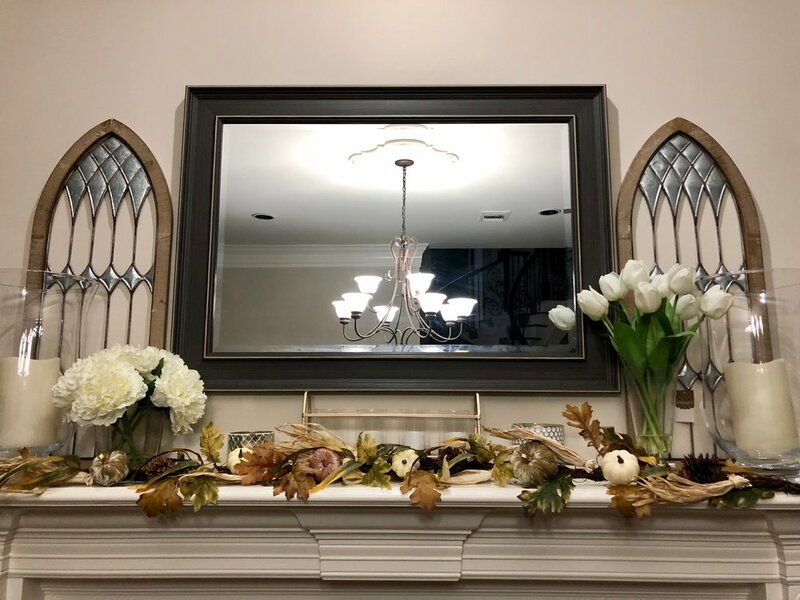 I found these cathedral metal wall plaques at my local Kirkland’s on clearance plus using a coupon made them only $25 each so these beauties will be on our mantel on either side of the large mirror year-round. I am so pleased with them as I had been eye-balling this type of decor that is currently everywhere (and I love it) but hadn’t quite seen any that truly lured me in like this one did. They’re sold out online, but you might can locate them at your local store if interested. I ordered a few more fall themed pillows from Zulily but also had a few from last year that I ordered from Pottery Barn on sale. They don’t have the same ones this year, but have some great options! 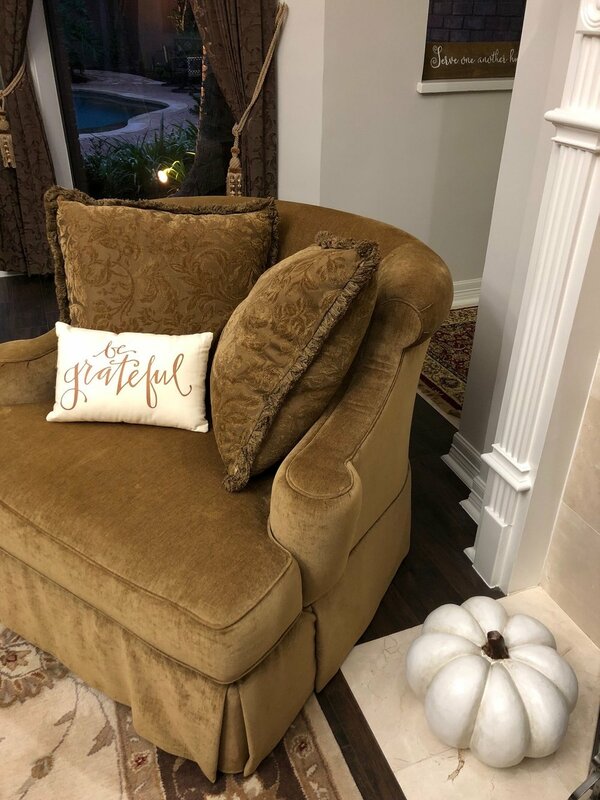 I sprinkled in some faux pumpkins I purchased at the dollar spot in Target last year as well as some gold, silver and white faux pumpkins from various places here and there and voila! My task was done. Side note…I painted our brick fireplace white myself. It was one of my DIY projects that I did while I had to sit around with my healing foot. It had been “rustic” so to speak since Hurricane Harvey flooded the house and the granite had to be pulled from the face of that fireplace. Last note…I mentioned previously that I purchased these harvest salad plates from Williams Sonoma. I love the whole collection but don’t want to store a 12 piece set to use a couple of times a year so I just went with the salad plate to set on top of a white dinner plate with a white pumpkin soup bowl. I also ordered this rust orange table runner from Amazon. I am not 100% sold on the fall centerpieces I found at Marshall’s so I can’t share the formal dining room table setting just yet. How do you get into the fall spirit? When do you start decorating? Linking up with Shay! You can also read my previous “How We” posts here.